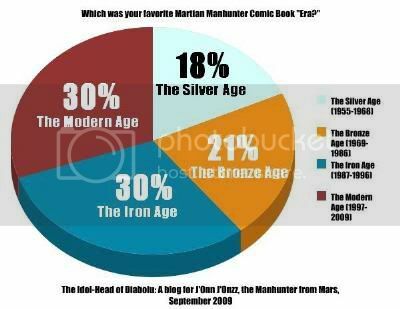 Which was your favorite Martian Manhunter Comic Book "Era?" I make plans, and God laughs, so here's poll results instead of something, you know, interesting. I have the same love/hate relationship with the Bronze Age as the Silver, but considering the disparity in material between the two, I'm a lot less conflicted about the former. I suspect given the dearth of '70s material, folks voted for potential more than execution. Bel Juz, Commander Blanx and the rest will have their day. Maybe. I dunno. You seven guys work on that. Meanwhile, the six guys who dig on Diane Meade, Zook, Vulture and the rest are also alright with me. "Guys" is meant to be gender inclusive, BTW. I suspect you also appreciate possibilities over reality, or maybe you're just kitschy. Who am I kidding? We like the Manhunter from Mars. That theory applies to all six decades of his publishing history. If I recall correctly, I was among the ten who favored the Iron Age. Seeing as it included JLI, American Secrets, and Christopher Priest on JLTF, how could I not? Maybe because it tied with the Modern Age, which was represented by Morrison and Waid JLA? Ah, but the rub is it also involved the only Ostrander series I've actually hated, Joe Kelly JLA, that business with the cone head, and Blackest Night? Honestly though, these are all valid and enjoyable "eras," I think they're all super, and I hope to do a better job of serving them in the future. (Well, except the Bronze Age. I've only got a handful of posts I can ring out of the '70s, right?) I'm extremely pleased to have fans who span so many decades, and I offer every one of you a virtual reality Choco! I usually enjoy the work CBR/Comics Should Be Good columnist Brian Cronin offers up, especially his weekly Comic Legends Revealed, but he's running a new feature this month concerning lists of the Top Five Most Iconic DC/Marvel Character's Covers that I find mighty disputable. For instance, his thirteenth spotlight shone on the Top Five Most Iconic Martian Manhunter Covers, and speaking as something of a fan (*AHEM*), it's Wizard Magazine caliber misguided. 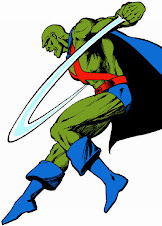 Right off the bat, let's be honest now, Martian Manhunter is not an iconic character. 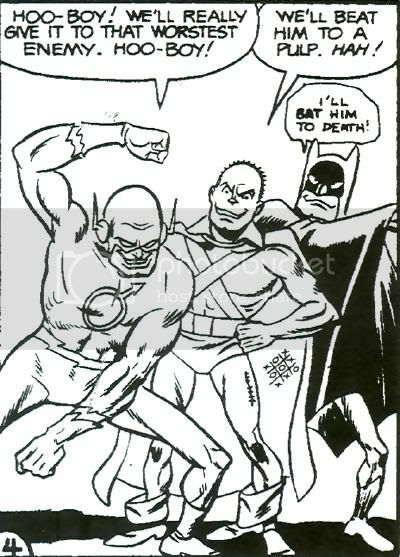 Until the 1997 Grant Morrison JLA revival, he rarely even popped up in analogues for the Justice League. Luke of El Jacone's Comic Book Bunker and Being Carter Hall recently made the wise observation, "J'Onn's greatest strength is that he is more butter pecan than chocolate; he's offbeat but appreciable." So we've got an essentially anti-iconic character who, outside of Justice League stuff, tends to appear in little-read obscurities when he appears in a book at all. Pretty tough to make a case for any "iconic" covers, I'd figure. 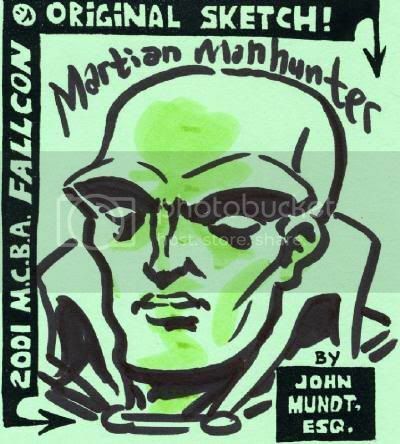 Per Cronin's criteria, the iconic status is "determined mostly subjectively by what covers are called to mind when one thinks of Martian Manhunter, but first being determined with a prominent objective standard of whether a cover is homaged a lot or featured a lot in histories of the character). 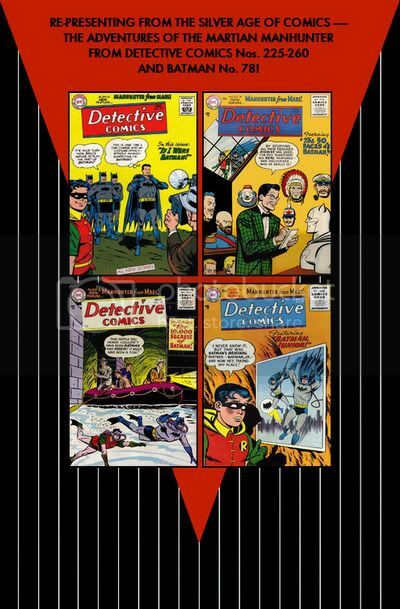 The notable exception is no covers from a character's first appearance (which isn't applicable to all characters, of course, just those who appeared on the cover of the comic they debuted in)!" Now, these are all nice covers, but with the possible exception of two are hardly "iconic" by any measure. The HoM cover was chosen pretty much at random to represent Joe Certa, and because it didn't feature the "idiotic" Zook. Regardless of it being the debut cover of his third ongoing series (Detective and HoM both count as ongoing, so an "eponymous" disclaimer is necessary,) I hardly ever see the zero issue anywhere, and it virtually never comes to my mind (and I've thought about J'Onn J'Onzz most every day since 1999.) Cronin actually references DC Comics Presents #28 as a contender, then awards an entirely random Starlin JLofA cover the top spot. 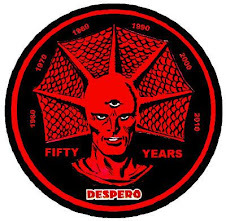 The argument could be made this was Manhunter's first mano-a-mano with Despero, but they'd already fought twice before, and the story was fairly middling. Only the oft-seen JLA #13 headshot and the first ever "team-up" issue of TB&TB could really rate as billed. Not heavily circulated, but Porter's first pass in his JLA style, and memorable. The second Manhunter team-up, and a very striking cover. A great cover to a book that introduced a lot of people to J'Onn in the 1980s after several years out of print, and the second fight with Superman. 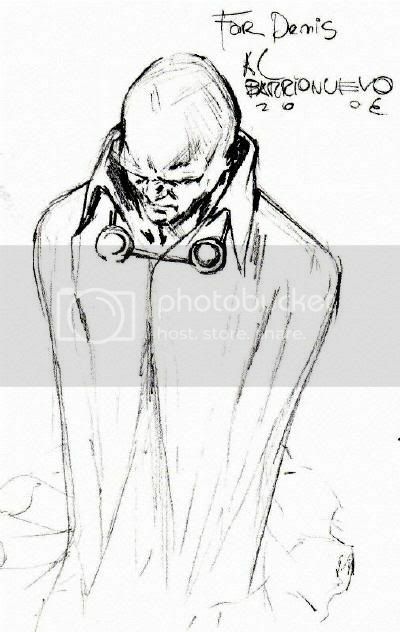 Speaks to J'Onn's overwhelming vulnerability despite his might, and his established role as jobber of the JLA. Good story, too. The first ever cover solo-starring the Manhunter from Mars, and a great shot of Zook, his sidekick through most of the 1960s. Featured in a couple of DC house ads in 1984 and one of the most dynamic Martian Manhunter covers ever. A holy grail issue, featuring the extinction of Mars, the first appearance of Commander Blanx, and the start of our hero's decade-plus exile from Earth/regular publication. One of the best known and most imitated covers of all time, and through his role as a founding member of the JLofA, J'onn J'onzz solidified his place in DC history. Loses points for Manhunter's lack of prominence, but remember, this was his first ever appearance on a U.S. cover. 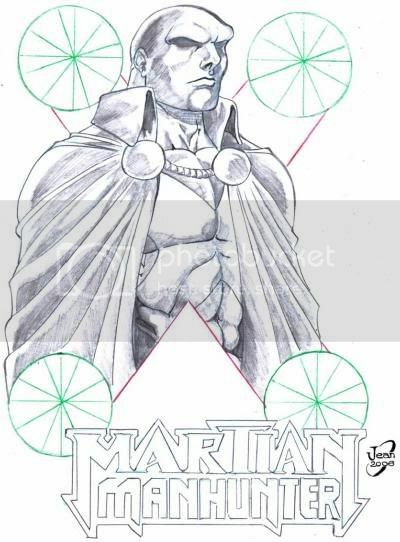 Martian Manhunter's striking return to Earth, the League, and regular publication. 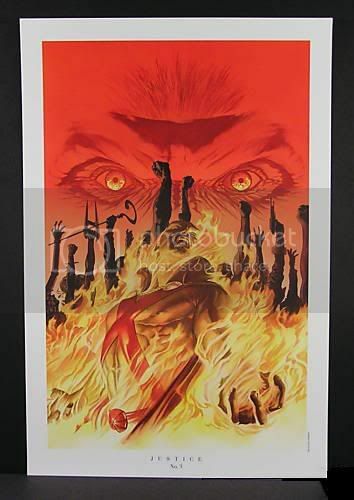 Heralded the infamous Detroit era and the end of his Bronze Age existence. Among the most imitated covers of all time, and assured Martian Manhunter's association with the JLI forever. Even his being minimized and off-center offers insight into the character's treatment for most of his existence. 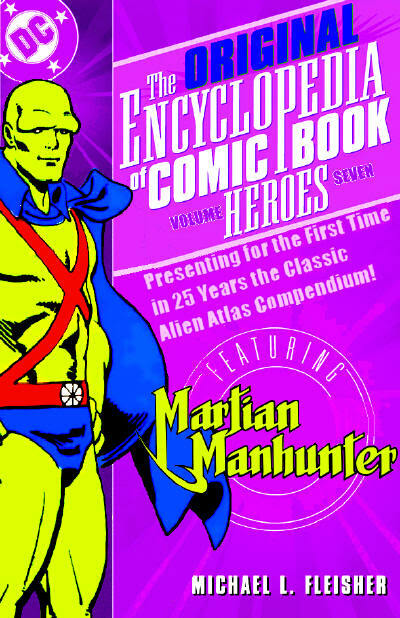 A classic and favorite of most every Martian Manhunter fan with memories of the 1970s. A key Bronze Age issue introducing Mars II, Bel Juz, and the character's decade long status quo. Revenge for every slight the character has ever been served. Best. Tagline. Ever! If not for this book, there's a good chance we wouldn't be having this discussion, as J'Onn likely would be sharing space with forgotten also-rans of the '80s. More modern MM fans were created by this book than any other. Probably the single most beloved J'Onn J'Onzz cover of his entire existence. Crystallizes the difference between Manhunter and every other major DC super-hero. All the favored elements are there: slope brow... definitive costume... association with lesser lights... the cookies... the combination of awesome power, droll humor, and vulnerability. The only thing missing is tragedy, and yet, if you really try, you can project that on their as well. 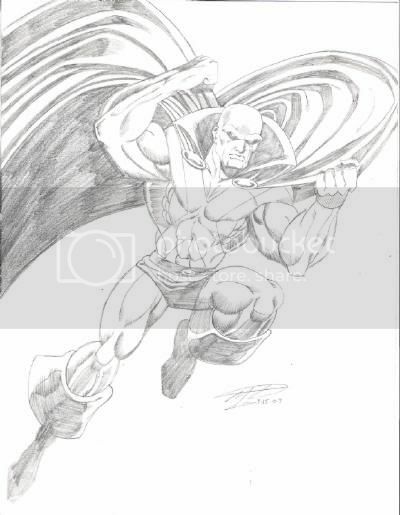 Twomorrows Publishing facilitated the return of Roy Thomas' fanzine Alter Ego as a back-up feature in the launch of their initial flagship title, Comic Book Artist, in 1998. Eventually, AE would spin off into its own magazine again, while CBA would be broken down into several other titles: Modern Masters, Back Issue, and to some extent even Draw! and Write Now! In the first new AE in decades, Thomas offered black and white reprints of Topps' 1966-67 super-hero parody mini-comics. Measuring 2 1/2" x 3 1/2" and eight splash pages (counting front cover and bogus ads in the back,) the books sometimes featured Thomas himself. 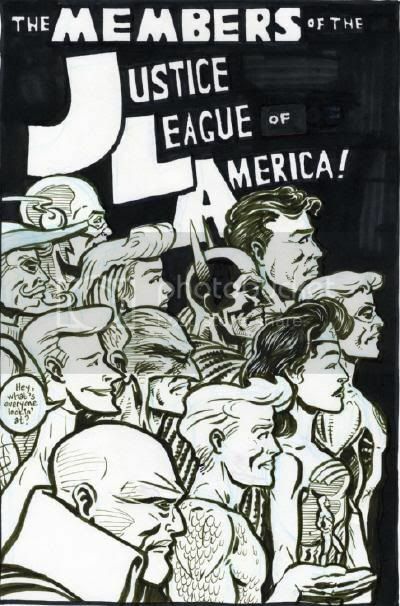 However, on the issue that pertains to this site, the work was produced by Len Brown (script,) Art Spiegelman (cover work,) Gil Kane (pencils) and Wally Wood (finishes.) 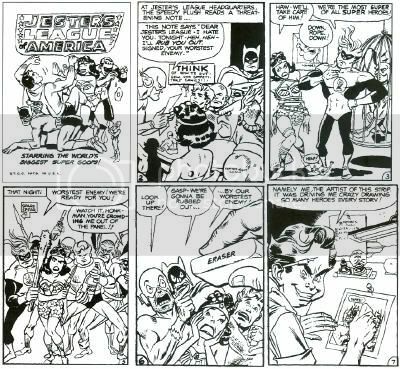 A parody of the Manhunter from Mars was among the Jester's League of America, and popped up in two panels. 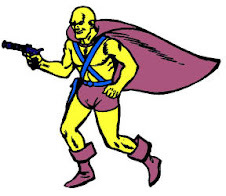 Only his shiny bald pate showed on page 2, but he received a full body shot alongside an ersatz Flash and Batman on page 4. The team braced for a confrontation with their "worst enemy," who turned out to be artist Gil Kane, who simply erased them all from his work table. "It was driving me crazy drawing so many heroes every story!" I'm sure Mike Sekowsky got a kick out of it, at least. Having proven itself worthy with its return to epic storylines and its acquisition of massive sales, JLA is the book to watch. But when finally cornered as to the secret of the series' success, Morrison only laughs. "The only reason sales dropped off in the past is that perhaps there wasn't a clear understanding of JLA's mythical underpinnings, which was what really gave the book its power. With JLA, you're dealing with concepts that are rooted in the mythologies of every single culture on Earth... When you look at each individual Justice Leaguer, whether it's Superman, Batman, Wonder Woman, Flash, Green Lantern, Aquaman, or even the Martian Manhunter, you can map them onto a different mythological character, and that's why they're so strong. That iconic power of the characters is what makes this book so successful. And with comics like the X-Men, you don't have that. You don't have characters so strong that they're almost gods... Superheroes are as powerful, as they are symbolic. They say so much, but even today, they have the potential to say so much more... Comics are incredibly sensitive barometers of social change. Just look at the way that Batman has reflected the culture over the years. 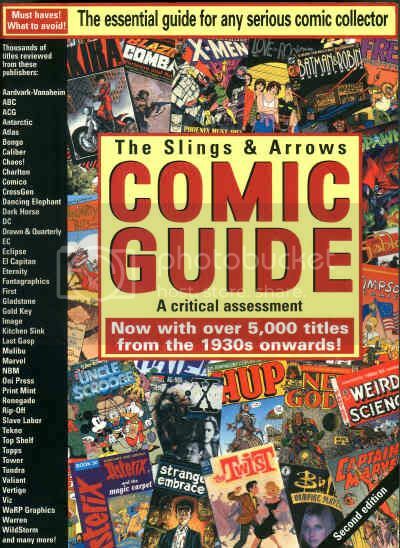 This material has a psychological and a spiritual significance, whether we're embarrassed to admit it or not..."
"The Silver Age began when DC Comics editor Julie Schwartz and his little stable of writers revitalized the market with lively, science fiction-oriented heroes. Julie brought an adult point of view to mainstream comics, and what several of us have been talking about recently is that characters from that era, like the "Barry Allen' Flash and the "Hal Jordan' Green Lantern, were all 'grown-ups.' I read Gerard Jones' book, The Comics Book Heroes, and he pointed out that these were heroes who never fought amongst themselves; held interesting jobs; and had wives or girlfriends. They were just very together, unlike most heroes today. Even in their spare time, the Silver Age heroes just hung out reading books about science and tackling weird medicine." "Looking at where comics are now, I also want to approach characters as adults... The last few years we've seen nothing but those tortured characters—the 'Dark Knight' Batman basically became a tortured adolescent—and what me and a few others like Mark (Millar) and Mark Waid (Flash, Kingdom Come) would like to do is bring heroes like Batman back as men. I'm talking about the Batman that I remember. The Denny O'Neil, seventies Batman with a big hairy chest, who was always kissing girls, and flying about in the Batplane all over the world..."
Though Morrison doesn't want to limit his audience to just kids—The Invisibles is definitely not a children's book—he does see the importance of bringing them back to comics. Of course, he also thinks that you'd have to be stupid not to. 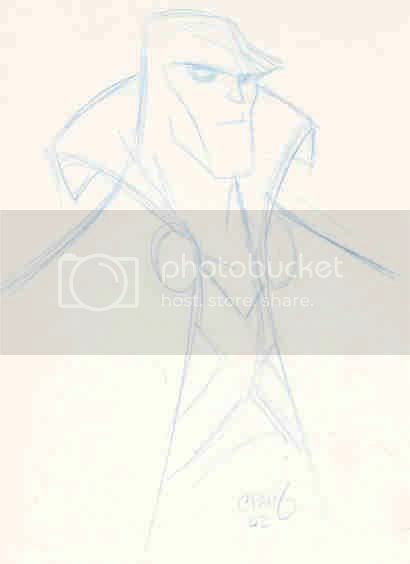 Working up cool ideas such as Justice League Junior—a hip and happening superhero team that would showcase younger DC characters such as Superboy, Mary Marvel and Impulse—he's setting out to attract the once prevalent, currently dwindling, younger audience, as well as attempting to safeguard the future of the industry he loves. 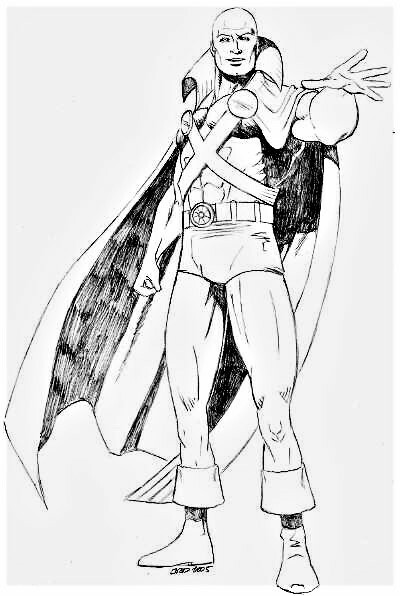 Here's another sketch from the artist of the final issue of the Ostrander series. Green Lantern Guy Gardner, Firestorm, Red Tornado, Dr. 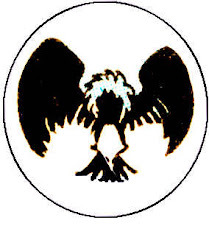 Fate, Hawkgirl, Elongated Man, Wonder Woman, Power Girl, Booster Gold, Blue Beetle (Ted Kord,) Vixen, the Ray Palmer Atom, Superman, Fire, Green Arrow, Black Canary, GL Hal Jordan, the Flash, Batman, GL Kyle Rayner, Aquaman, Ice, Captain Marvel, Black Lightning, Plastic Man and of course our own J'Onn J'Onzz. Did I miss anyone? Here's the artist of the 2006 mini-series bypassing the conehead for the classic. 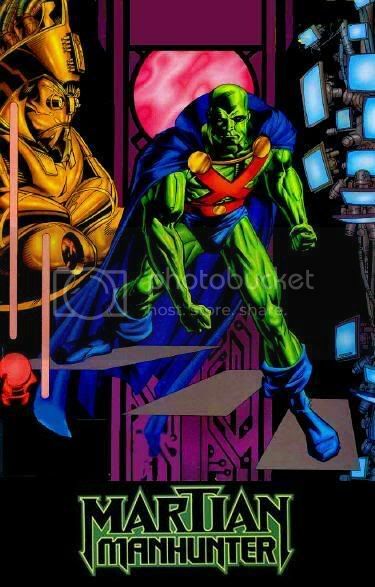 Martian Manhunter arrived in 225, accidentally transported from Mars with an ever-increasing array of abilities initially subsumed by his assumed identity as a police officer. His stories became ever more outlandish, and his demise was hastened by the addition of irritating alien companion Zook in 311, but he lasted until 326 before being bumped to House of Mystery from 143. At least he had a tenuous link to the theme of the comic, though. What Aquaman, however nicely drawn by Nick Cardy, was doing in 293-300 is anyone's guess. With 143 the comic changed direction abruptly as the Martian Manhunter transferred from back-up status in Detective, but Jack Miller's scripts and Joe Certa's art never manages to rise above mediocre. 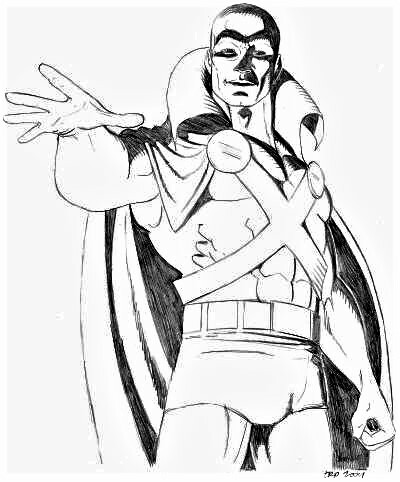 More fondly remembered was a second superhero strip, 'Robby Reed - Dial H For Hero', by Dave Wood and Jim Mooney, with Robby's ever-changing super-alter ego. Neither strip had much staying power, and when Joe Orlando became editor with 174 he wasted no time in booting the pair out. By 1970 the title was failing to live up to its name, and drastic surgery came with 199, as Batman was evicted, giving Superman the chance to team with other characters... 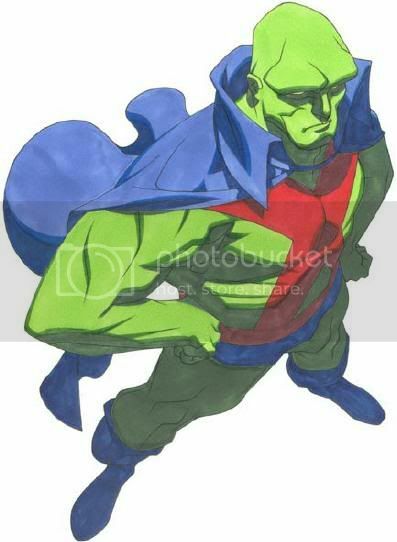 The best of a generally decent bunch, though, is 212's return of the Martian Manhunter. When last seen in Justice League of America 71 he'd left Earth to locate other survivors from his race, and this story followed on. 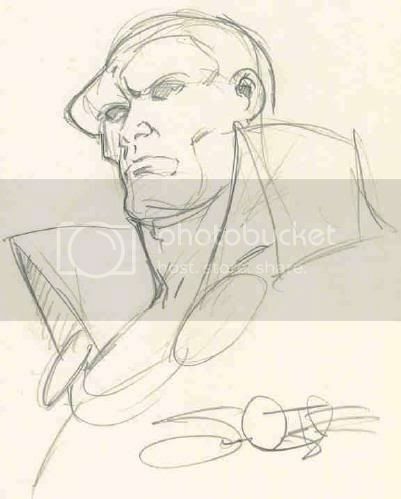 In 449-451 there was a Martian Manhunter strip written by Denny O'Neil, and nicely drawn by Mike Nasser and Terry Austin, that heralded the return of the character after an absence of many years. In 10 Josh Siegel produces a shrewed and non-mawkish exploration of the Martian Manhunter's difficulty in being accepted by Earthlings. Debuting in Detective 225, and running there for years, there's a case for Martian Manhunter being the start of the 1950s superhero revival. Despite this and being a founder member of all Justice League incarnations, he's always been a second-stringer. The problem was that he's a near-omnipotent alien with a fatal weakness (fire), and DC already have a far more popular near-omnipotent alien with a fatal weakness. Gerard Jones circumvents this for the first series by concentrating on the Manhunter's assumed identity: John Jones, Denver police officer. It's set soon after his arrival on Earth and the plot is a checklist of the 1950s in hindsight. Payola, quiz fixing, UFO scares, a pink Cadillac, Mad magazine, the fear of Communism, the new suburbs, Elvis Presley (or as near as his estate's lawyers will permit) and Leave it to Beaver are all thrown into the mix for a dark and atmospheric story lifted further by Eduardo Barreto's art. The succeeding series is dull stuff, as suppressed memories rise to the surface and, yawn, the Manhunter must confront his true identity. A spiritual quest also starts the poor 1996 Special, which soon degenerates into fights, but the 1997 JLA Annual has a good Martian Manhunter solo story, as does the 1989 Secret Origins 35. 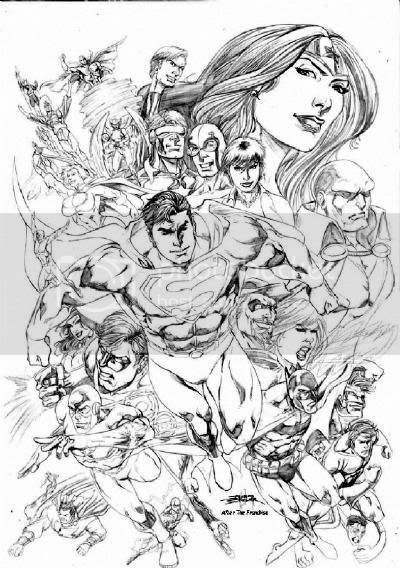 Check out this dynamic piece from the former Wildstorm Studios and current DC artist. Visit Kirby's page at deviantART. Ah, the old Vision comparison again. Sigh. Visit Vincent Fourneuf's page at deviantART. I've been promising Tom I'd post this for ages, and I wanted him to get at least a solid 24 hours for his efforts. Now, I'm confident my weekend posting will be screwed, so he'll likely get at least 48 hours before I can return and back post to fill-in for my absence. It's a very professional job, just like his front cover, so I hope ya'll dig it 'til I get back. I've got to troll eBay more often. Rob finds great stuff there for the Aquaman Shrine all the time, and I've been missing stuff like this! 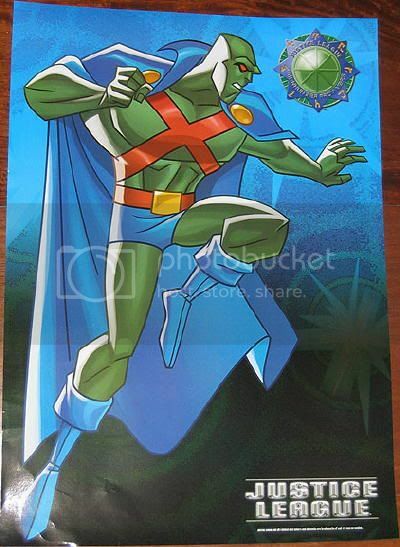 Martian Manhunter Poster 15" x 21"
We only sell 100% Original Licensed Justice League Products. This item is Brand New and Factory-sealed. Definitely a must-have for every Justice League collector!!! 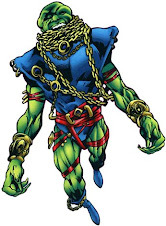 A great mini-series that heavily showcases J'Onn J'Onzz. If you haven't read it, you need to. 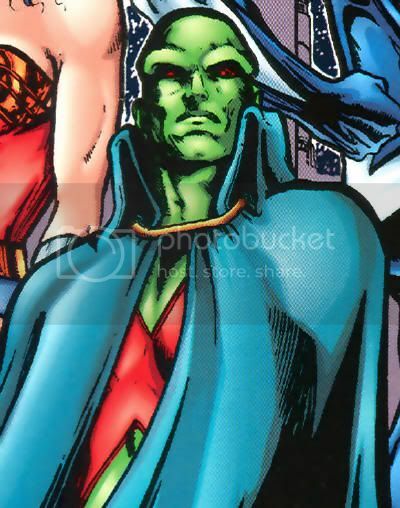 Alternate timeline J'Onn J'Onzz is better than nothin'. 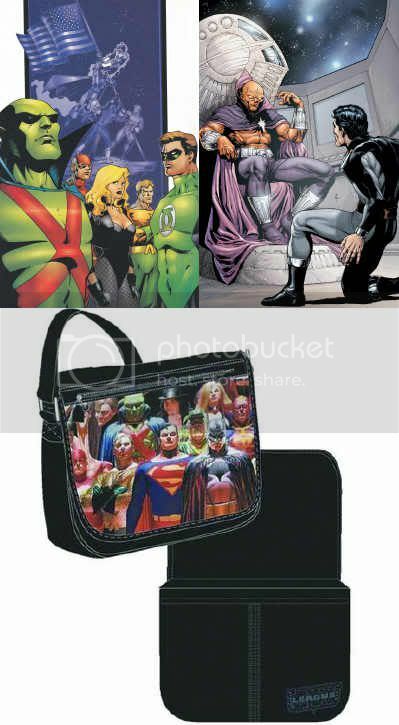 WBased on the best-selling graphic novel, Kingdom Come, by Mark Waid and Alex Ross, this canvas messenger bag features artwork of the future of the DC Universe and is perfect for carrying your papers and school supplies. When I carry a man-purse, I don't make the kind of show of it a print would elicit. Pretty sweet for what it is, though. Isn't that a Justice image, though? 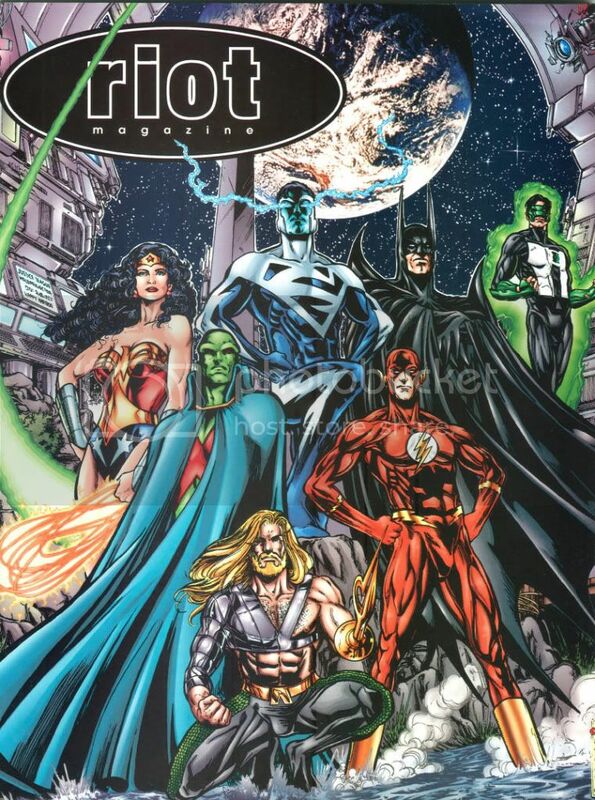 In this action-packed adventure series, the world's greatest superheroes, including Superman, Batman, Wonder Woman, Green Lantern, The Flash, Hawkgirl and Martian Manhunter, join forces as the Justice League to battle powerful villains, supernatural creatures and evil entities determined to take over the world and destroy the League. All 91 episodes from the "Justice League" animated series now available for the first time in a complete 15-Disc collection, with special collectible packaging. Featurette: "Unlimited Reserve: Exploring The Depths Of The DC Universe"; English SDH, Spanish and French Subtitles. The moment you ve hungered for finally arrives! Who controls death in the DC Universe? NEKRON - Lord of the Undead! The dark being behind the undead Black Lanterns makes his presence and purpose known, and our heroes discover they re not only fighting for their lives, but their after-lives as well. Don t miss this game-changing issue from superstar writer Geoff Johns and stellar artist Ivan Reis! Humans and Kryptonians are the only two races in our solar system, right? Wrong! 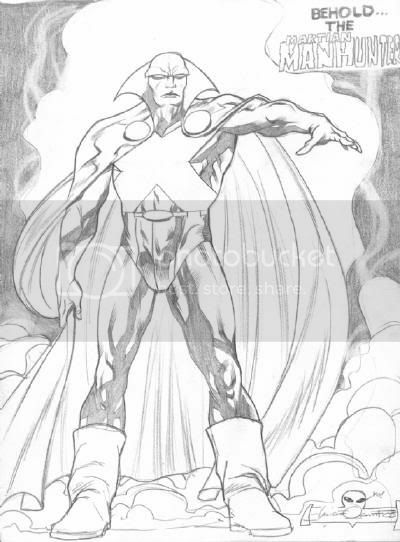 Jemm, Son of Saturn, ruler of the super-powered Saturnian race, arrives in Kandor demanding answers to New Krypton's recent actions answers he intends to get even if he has to fight his way through Commander Kal-El and the entire Kryptonian army! Retailers please note: This issue will ship with two covers. For every 25 copies of the Standard Edition (with a cover by Gary Frank), retailers may order one copy of the Variant Edition (with a cover by Mark Buckingham). Please see the Previews Order Form for more information. Let the latest massive reinvention of a character begin. The Teen Titans join forces with The Titans and The Vigilante in this new title collecting the Deathtrap storyline from TEEN TITANS ANNUAL 2009, TITANS #12 and 13, TEEN TITANS #70 and VIGILANTE #5 and 6. She's in here somewhere. Whatever. Is it an unknown artist? Yes. Is it a Tom Mandrake swipe? Yep. Am I posting this solely to fill a gap in posting from a previous date? You betcha! Is it bad for what it is? Nah-- s'okay. This was from the MCBA FallCon Comic Book Celebration of Minnesota. Mundt, artist of The Adventures of Monkey, can be found at World of Monkey Productions. A piece by '80s DC and Star Trek artist Arne Starr, and found at auction on eBay for Just $15.00 as of this writing. I had friends I hadn't seen in months over this weekend, and am about to take a three day trip into Mexico, putting the squeeze on this week's posting. My monitor is completely shorted out, alternating between a gray/blue tint and full-on old school monochromatic green screen, making quality control on my color scans impossible. My computer is refusing to read my two primary storage drives. It's C: or bust. I suspect my decade old build is about to crash. I've got a great new program that converts scanned pages into editable text that retains columns and includes jpeg images. It's boss, and I can't stop playing with it. I've really got to finish Super Powers coverage at two blogs, especially the poor neglected Justice League Detroit. All this being said, I appologize for continuing to lean on the Comic Art Fans pin-up crutch. I also solicited a bunch of opinions from readers last month I have seemingly ignored, but I promise that I'm doing my best to get to a place where I can institute positive changes. I've been run so ragged of late, I hadn't even realized this blog's second anniversary had come and gone unnoticed two weeks ago. The whole point of this post was to ask about ways to celebrate, and a quick double check left me at "oh." So anyway, what I'd really like to do is clean up some of the unfinished messes around here, but there's no point in working to restart, say, Bloodwynd coverage if no one cares. The goal is to optimize what time I have by focusing on the stuff folks really miss, or have been anticipating without reward. Also, it's an excuse to reuse an old image I don't need to proof, but let's stay on task. If you would, please leave a comment below regarding whatever I haven't gotten done that you wish I'd get around to already. JLI coverage? 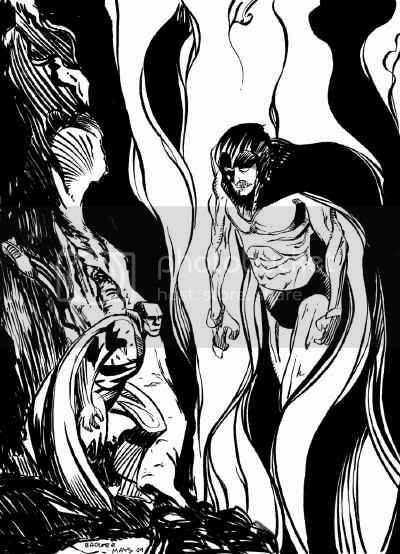 Ostrander/Mandrake? The first appearance of Professor Hugo? More Morrison-era JLA? More Silver Age? Jemm? Vile Menagerie? Gypsy? Zook? I know there are gaps-o-plenty hereabouts, so give me a shout, and I'll do my best to plug some holes. Also, I really appreciate everyone's patience and interest. You guys are the best! Visit the artist's website at Lockblok. I like all three of these pieces, but I'd say a hairy human brow alone does not a Silver Age Manhunter make. 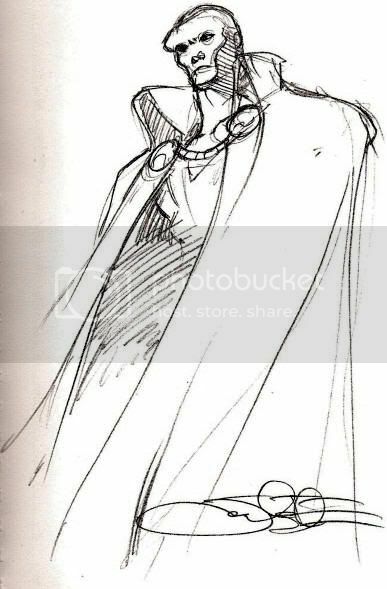 Look at that Vision collar and the mammoth clasps and tell me that's not thoroughly Modern Age. Visit the artist's website at Studio-Hades Illustration and Design for even larger and more varied looks. Visit the artist's website at Studio-Hades Illustration and Design for even larger and more varied looks. I'm laboring to catch up from holiday slack and the Super Powers crossover that just. won't. end. Three more posts related to the latter, which I'll inevitably backdate, and then let us never speak of it again... except I've got two more still due for the Justice League Detroit blog. Nooooo!!!!! 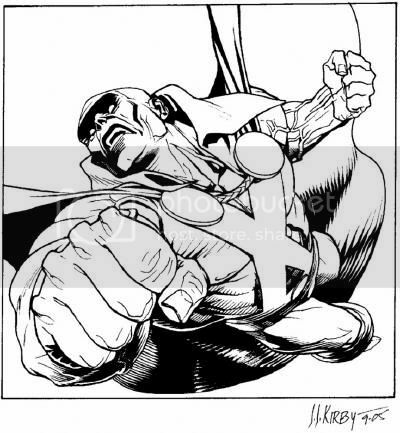 I don't know from whence this piece came or what purpose it served, but I love me some Mike McKone... especially on J'Onn J'Onzz. You really must enlarge this number to appreciate one of the finer if least prolific Alien Atlas artists. 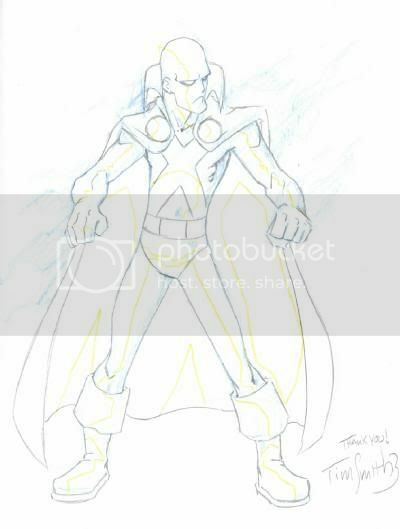 I don't know if it's on the level, but a person claiming to be McKone is selling the piece for $150.00, if you really dig it. 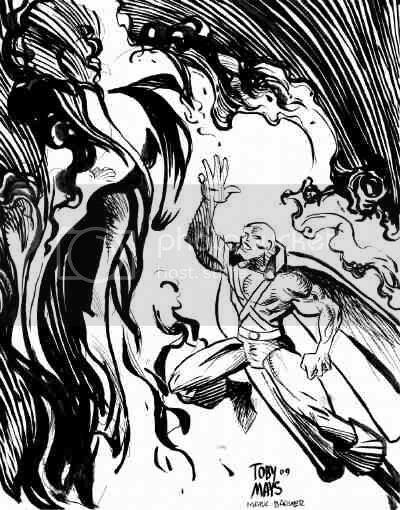 J'Onn J'Onzz meets his god, as inked by the fellow who first truly conceived H'ronmeer visually, 1988 Martian Manhunter mini-series artist Mark Badger.